This is Wayback Wednesday, your midweek blast from the past! In this feature, we dig into the archives, look back at the history of basketball gaming, and indulge in some nostalgia. Check in every Wednesday for retrospectives and other features on older versions of NBA Live, NBA 2K, and old school basketball video games in general. You’ll also find old NLSC editorials re-published with added commentary, and other flashback content. This week, I’m taking a look back at Arch Rivals. When you think of arcade basketball video games by Midway, the titles that will most likely spring to mind are the original NBA Jam, its follow-up NBA Jam Tournament Edition, and NBA Hangtime. That stands to reason as they are some of the best games of their genre, but NBA Jam wasn’t actually Midway’s first attempt at making a foray onto the virtual hardwood. In 1989, four years before the debut of the original NBA Jam, Midway released Arch Rivals: a two-on-two basketball game with up-tempo gameplay, and a very casual approach to the rules of the sport. Billed with the subtitle of “A Basketball Brawl”, Arch Rivals is a less realistic (and more violent) take on basketball than a game such as Lakers vs Celtics. 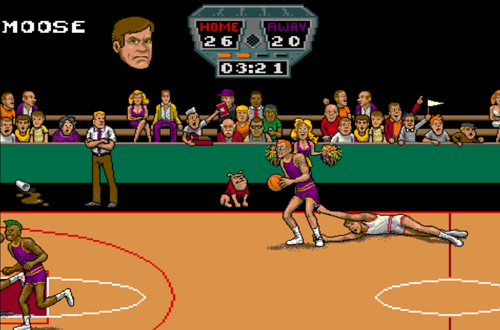 As mentioned, gameplay features two-on-two action with very lax rules, which allows the players to punch their opponents in order to steal the ball. Steals can also be made with a tackle manoeuvre called the “flying leap”. In the arcade version, the flying leap will result in an opponent’s shorts being pulled down exposing their underwear in comical fashion, an animation that is absent in the home versions. Missing on the leap will result in a player tumbling and rolling along the floor in a cartoonish manner. It’s also possible to trip over the referee, and slip on spilled drinks and other obstacles. Each game is comprised of four quarters that are four minutes in length, with a jump ball at the beginning of each half. In the event of a tie at fulltime, a sudden-death overtime period is played. Apart from that, it’s basically two-on-two basketball. There are two and three-point field goals, and a twenty-four second shot clock, which is the only possible violation in the game. Unlike later arcade basketball games, the dunks are not outrageous; in fact, there are only a few different dunking animations. Dunks can randomly shatter the backboard however, a detail that carried over to NBA Jam. There aren’t any real players or teams in Arch Rivals. Instead, users select the player they want to control from a list of fictional characters, all of whom have a particular skill or trait: Blade (a crowd pleaser), Hammer (rebound king), Lewis (top shooter), Mohawk (tough & mean), Moose (a real champ), Reggie (All-American), Tyrone (defensive giant), and Vinnie (a great player). The two-man squads are selected at random, with the arcade version featuring six teams: Chicago, Denver, New York, Los Angeles, Brawl State, and Natural High. In the Nintendo Entertainment System version of the game, Denver and New York are absent. While it’s fun, Arch Rivals doesn’t hold up quite as well as NBA Jam. The gameplay is straightforward and similar to its spiritual successor, but it’s very primitive. Like a lot of early basketball games, there’s no sprint control, with players instead gaining temporary bursts of speed in order to keep up with each other. Dunks and other easy shots miss a little too often, and teammate AI leaves a lot to be desired. Indeed, you need to instruct your teammate on when to shoot and pass, and they can also be rather lazy on defense. CPU opponents, meanwhile, tend to be pretty cheesy with shooting and steals. There is some differentiation between players, but it feels fairly minor. Movement is relatively fluid and the controls are responsive, though it is rather tough to defend and rebound; boards are grabbed on the floor, and blocks are quite rare. The best way to defend is to punch and tackle opponents, which is only appropriate as it’s a big part of the game’s gimmick. 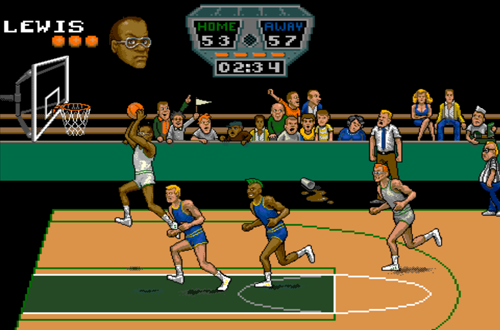 It’s also unusual to play an arcade basketball game without crazy dunks, though as seen in the licensing pitch video for NBA Jam, it too was originally conceived as a slightly less cartoonish take on basketball. All the same, without the flair of high flying dunks or a mechanic like “On Fire”, the gameplay can feel rather repetitive, even by arcade basketball game standards. Graphically speaking, the original arcade version of Arch Rivals is quite impressive. The players, their animations, and the environment all look great. There are also voice clips when your player calls for the pass, or for his teammate to shoot. These elements naturally aren’t as good in the home ports, but each platform does an admirable job of replicating the style of the arcade version. There’s some fine presentation with the cutscenes that appear after baskets, and broadcast-style reports between quarters, but they do get repetitive. Although they’re short, showing the cutscenes after each basket also interrupts the flow of the gameplay somewhat, which can get frustrating. With all that being said, Arch Rivals is still playable, and once you get the hang of it, it can be quite enjoyable. It’s a little tougher to master than the old NBA Jam games due to the lack of a sprint control and far tougher shooting mechanics, but the basic elements of the familiar arcade basketball experience are there, albeit in a far more primitive form. There isn’t much in the way of replay value though, as Arch Rivals lacks a tournament or season mode. Much like Double Dribble, it simply offers solo and competitive exhibition play. That’s fine for an arcade title intended to rotate gamers who keep putting in money, but it’s very limited as a single player game. As such, I don’t think it has anywhere near the same amount of appeal as the original NBA Jam games. Admittedly I grew up with NBA Jam and didn’t play Arch Rivals until years later, but even putting aside my nostalgia, it just isn’t as good. Without a tournament mode, there’s less incentive to keep playing, and the lack of ridiculous dunks and real NBA players are likewise drawbacks. Still, it’s possible to appreciate the gameplay for what it is, as well as the game’s place in basketball gaming history. 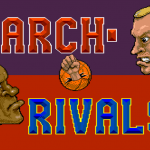 While Arch Rivals isn’t technically part of the NBA Jam lineage, it clearly inspired the style of gameplay that its successors would go on to flesh out and perfect. To that end, it deserves recognition as an innovative and pioneering title. In its day, it could be considered a great game; as a retro gaming experience, it still has something to offer, too. I’d recommend the arcade version over the home ports, particularly the NES release which had far inferior hardware to work with. As for Midway, better technology, further development of the style and concepts, and securing the NBA license would see them soar to greater heights with NBA Jam. However, in creating a solid foundation for a fun experience with Arch Rivals, they established the arcade basketball game genre with a title that certainly packed a punch in its own right. I always thought the graphics were kind of underrated, for its time. I liked the artistic approach to the game. Back in the day, the bigger characters looked so cool to me. A tennis game made around the same time had big character models, and I was impressed with that as well. Some of those arcade games from the late 80s/early 90s definitely have some impressive graphics and sound. What they lack in substance/replay value, they make up for in looking a lot better than what you’d expect to see on home consoles and computers.